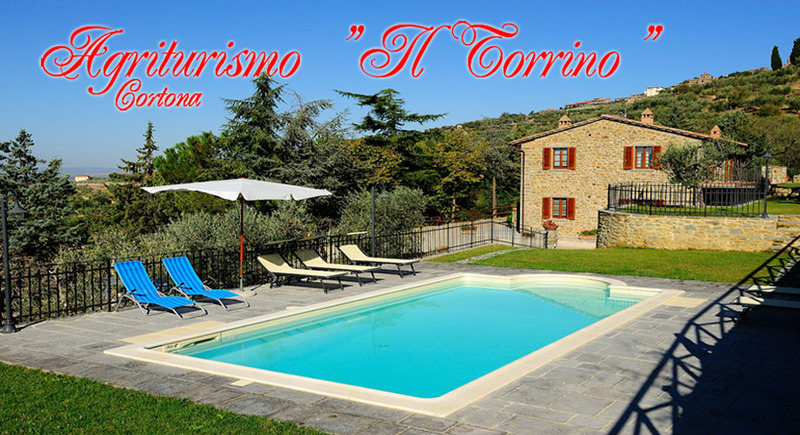 We would like to bring you inside our country house “Il Torrino” in Cortona, Tuscany, region and traditions; we would like to have you as our guests. Moreover we would like to have your feedback about your travels and holidays in Tuscany so that we could exchange information and secrets. Cortona is little and beautiful village in Tuscany and it is very well known all over the world, especially after the movie “Under the Tuscan Sun”, which was set in this part of Tuscany. So…we are going to open our country house doors, a magic land, as we use to call it. Our Farm House in Cortona have been a house that we renovated recently and it keeps perfectly the Tuscan feauters, those you can find in the country and that color the area. Walls of stone for the extorios, a beautiful swimming pool in the garden, looking at the country side and everything that guests might want from a farmhouse: large rooms, high ceilings, furnished in typical Tuscan country style. For who likes to cook or likes just to try Tuscan recipes there are two big spaces devoted to kitchen and living rooms, places for meeting and conviviality. The magic of a medieval village full of charm that have been perfectly preserve. The sunny light early in the morning, that illuminates every corner of the city and the countryside. The origins of Cortona and all the events in program all over the year. From Cortona it is very easy to reach all the most famous towns in central Italy like Florence, Pisa, Siena, Perugia and Rome, another good reason to come and stay at our Cortona Country House “Il Torrino”. This entry was posted in Cortona Farm House, Cortona Holiday House, Cortona Holidays, Country House Cortona, Country House Tuscany, Tuscan Holidays and tagged Cortona Farm Houses, Cortona Holiday House, Cortona Holidays, Country House Cortona, Country House Tuscany, Tuscan Holidays. Bookmark the permalink. Country House in Tuscany: One Place Show!